We are pleased to present an ensemble experience that is perfect for homeschool or for after school. No experience necessary. $60 for a two-week session. Includes 45 minute classes twice a week. Second level session available after completion of the first. Small groups (3 -5) for more individualized instruction. Start dates are May 26, June 9 & 23 and July 14 & 28. Classes will be held on Thursdays and Saturdays. Register by April 1st to receive $20 off your second session. Is your child having a hard time making the choice between art and music when they reach middle school? Perhaps you are homeschooling and looking for a safe place for your child to learn and create music with peers. Maybe you just want to be a part of your local musical community. Save a seat in one of our ensembles today. Our program begins in the fall. ****Too tiny for the saxophone? 2nd and 3rd graders can begin with the recorder ensemble and make note-reading a snap when they get that shiny new horn. Mrs. Williams has been teaching general music, band, orchestra and private lessons for thirteen years and has a bachelor's degree in music education from Mansfield University of Pennsylvania. 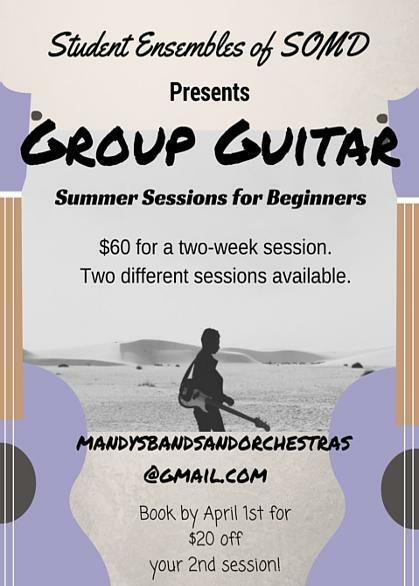 Currently, we are focusing our efforts on building up the band (flute, clarinet, saxophone, trumpet, trombone, and percussion) and beginner guitar classes. If you are looking for a strings program (violin, viola, cello and bass), give us a shout. Small groups can be arranged. Private lessons are also available on any instrument. Refer a friend and have a free fun lesson together! This is a new program. Your input and ideas are always welcome. Enjoy your new digital band book right away when you drop us a line. It comes complete with tutorial videos, sound files, links and other nice features. Hard copies will be available in September. Like and share our Facebook page to help build the band. Help us with all the bells and whistles. I often think in music. I live my daydreams in music. I see my life in terms of music. ... I get most joy in life out of music.